The phone rang at 5:33 this morning. The person, whose purpose I couldn’t quite grasp with my clouded sleep-brain, said that he was “on his way”. As you might know, Bodhi, Hubby’s draft cross, is going down to San Diego to help a boyman become a horseman. And along the way, the boyman’s love, affection and time in the saddle will rub off on Bodhi. Win Win. Anyway, I won’t bore you with the scrutiny both hauler and client (me) put each other through to find the right rig to equine ratio (in light of the EHV-1 outbreak over here on the West side of the Rockies)… Suffice it to say, even though I had never used this particular hauler before… he passed all the tests. It felt right. And, truth to tell, it was quite refreshing to get a call at 5:33 in the morning instead of 11:57 in the evening, which is usually my luck with haulers. If you have never thought about driving large live animals (who kick, throw their weight around and need to eat/drink/sleep) long distances, take a minute to think about all that could go wrong (with the animals and the rig). Then think about the implications of weather, roads, traffic, crazy drivers and potty breaks. One has to really like surprises to be a Long Haul Animal Trucker. And, haulers not only have to haul (and all that implies) but they have to be master mappers. You see, they need to fill their trucks in order to make animal hauling financially viable. So every call that they get has to be plotted and configured in some efficient route where all horses make it to where ever they are going and that every truckload is a full load. It kinda reminds me of the game, jacks. Do you remember that game? You take the metal jacks out of their little felt pouch and drop them onto the floor. Then you bounce the little ball and pick up one jack. Then you bounce the ball higher and pick up two jacks. Then you bounce the ball even higher and swipe up three. It is at about this time that you realize you’ve got to pick up four jacks but they are spread out all over the floor. So, you bounce the ball really high and make one huge, sweeping gesture to catch all four before the ball meets the pavement. I had to think quickly but I hadn’t had my coffee. I tried to sound fresh and awake as I stumbled out to my computer. Stalling for time, I asked him where his other pick-ups were for the day. He told me, “on the coast”. Hmmmm. I said that I was looking right at my computer and from where he was (South of me), ‘the coast’ was closer to him. It would be better for him to go to the coast and get that other horse first and then come to me (crossing fingers). Anyway, I had just gained a few hours… I immediately brewed some coffee and proceeded to drink it. First things first. I felt like I was sending my kid off to summer camp. I was ironing his name into all of his T-shirts… I wrote ‘NO ALFALFA’ on the luggage tag tied to his halter. I neatly packed a manilla envelope with his lease agreement, photos and every phone number associated with everyone involved. I again wrote ‘NO ALFALFA’ on the envelope and underlined it twice. I brushed him, doused him in Peppermint Summer Protection spray and then gave him some CHILL from Omega Alpha. I thought about taking some CHILL myself because it was clear that I needed it more than he did. I readied the trailer and sighed, really, really, really long and hard. I was going to miss him. The driver called me exactly like he said her would when he had passed through Sacramento and I knew that I had 30 minutes to get there. I put Bodhi’s halter with the luggage tag on his huge face and loaded him right into my trailer. He had grown since the last time he was in there. I got the visual stuck in my head of Alice in Wonderland after she ate the “grow” cake and her arms, head and legs burst out from the windows in that tiny house. I decided to not use the divider. He needed the room. I locked everything up securely and hopped into the cab. It was time. The whole way there I was gripping the wheel. I have no idea what I thought was going to happen but I just wanted to be super vigilant. I didn’t want anything to happen during my leg of the expedition. I could see Bodhi’s nose pushing out through the window screen as he munched on his hay. He was happy. A good sign. The CHILL was working! As I approached the baton pass hand-off area, the clouds parted and the angels sung. I saw the Hauler … and his trailer was beautiful. In fact, I had trailer-envy. It was big, wide and gorgeous with every bell and whistle available. And, Bill, the driver, was there right on time – a good sign. Bill, stepped out of the cab with his paperwork in hand and was totally charming in a Cowboy way. I knew he’d been doing this for his entire life. Bill toured me around his rig with pride as he showed me the ladders, buckets, water, hay, bowls, tools, spare axles, and every other possible thing that he needed, which were all packed neatly and orderly throughout the rig. My confidence was high. Bodhi was going to be fine. Bill took Bodhi’s leadrope and sweetly introduced himself. He then took Bodhi on board, gave him two already prepared nets of grass hay, some water and a noogie on his forehead. Bill shut the bars and opened the window so Bodhi could feel the fresh air on his face through the screen. I shook Bill’s hand and reminded him, once again, about the ‘NO ALFALFA’ thing to which he smiled and nodded patiently. Suddenly, I felt as if I was watching the Griswolds turn the wrong way to Wally World. Nooooooo! I didn’t want this huge trailer (and Bodhi) to be trapped on the horribly windy roads of Grass Valley! Quick, I had to call Bill so he would turn around immediately. “You are going the wrong way! Turn around! I was quite nervous that he wouldn’t be able to U-turn that huge rig. So, I sat at the entrance to the hand-off parking lot and waited for him to pass me going the other way. And he did. About a minute later. With a heavy heart but a smile on my face, I left the spot where I last kissed Bodhi and headed home to await the good news of his arrival into the arms of the boyman. Best of luck my boy, study hard and be good. Mamma loves you. Good luck, my boy, Mamma loves you. HORSE AND MAN is a blog in growth… if you like this, please pass it around! Results of the recent Prison Gentled Mustang Auction, The Nag Full Face Shade and other tidbits. 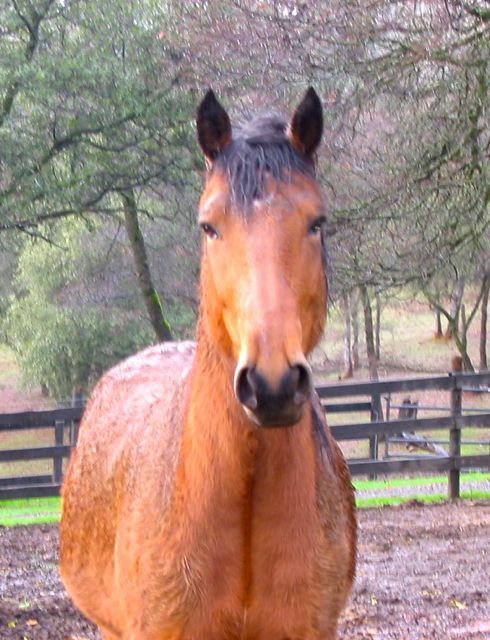 Every Spring My Mare Joins a Religion… And, a List of Things I Wish They’d Invent! Thank you! I’ve heard wonderful things about Wings Transport. Can’t wait to see pics of Bodhi doing great things with his new person. That’s a very cool thing you did. Best of luck to Bohdi on his new adventure. We’re going to Portales, NM, to check out our son’s university next week, so I understand how you feel. He’s our only child, and Mom is already experiencing “empty nest syndrome”. Fortunately, we have our little “managerie” for comfort. Love your blog, just absolutely love it. I have to ask, who was the hauler? Was this Bill from Sabre Creek, Have Trailer Will Travel? It just sounds like him… super nice guy, gorgeous rigs (I drool every time I see his trailers) and he does a fabulous job. Lives near us in AZ. Will u answer in the comments and I’ll come back to see? I always like to know who’s doing a good job hauling, and I’d use him in a heartbeat. People are complicated “animals”, aren’t we? Capable of both feeling and expressing such bitter sweet emotions. Bravo Dawn, for having the strength to send your (husbands) Bodhi off like that. Typical that the Hauler called before you even had a chance to fortify yourself with caffeine though – typical and really NOT fair. ahh well, life seldom is I suppose. Well wishes, it sounds like you have done not only a very good thing – but you have done it extremely well . Looking forward to hearing more about Bodhi. *hugs* Please keep us posted. Thank you. Big, lovey baby! <3<3 to you, Dawn. He's such a pretty boy!